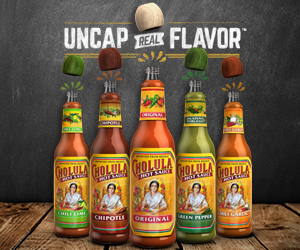 Cholula Hot Sauce is a delicious sauce that can be added to pretty much anything. It has so much flavor, but nothing too hot at all. It definitely has a mild spice level. Cholula is light reddish-orange in color with a watery consistency. 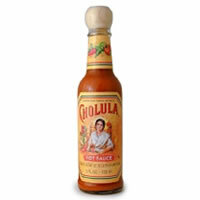 Cholula is one of my favorites because I can add it to burritos, tacos, eggs, rice, crockpot meals, and so much more. It’s my personal favorite on all types of Mexican food. I have to admit that the mild spice level is perfect for people who want a hot sauce but cannot handle intense burn. It’s a sauce that almost everyone will enjoy, but personally I think a little more spice would make it even better. Overall, this sauce is delicious, essential, and perfect for almost everyone. This sauce is reddish-orange in color. It has a watery consistency. It smells like a mix of peppers and spices; it makes my mouth water. It has a slight spiciness to the scent, but nothing much. The spice level is mild. I wish there was a little more spice, but I do love that it’s a sauce that can work for almost anyone no matter their hot sauce spice tolerance. I tasted Cholula Hot Sauce on chicken tacos and it added so much sweet/spicy flavor. The perfect unique touch of spice and flavor for my family. I could handle a little more spice to it, but overall it’s amazing. Cholula sauce on chicken tacos with a Dos Equis Lager on the side is perfection! Cholula has very few ingredients. The main ingredients are Arbol and Piquin Peppers, Salt, Vinegar, and Spices. I am not sure what it is about this mix of ingredients, but it creates a delicious sauce. When I added this hot sauce to cooked chicken and allowed it to cook a bit, the sauce remained delicious, but you could taste a little more of the flavor. The 5 oz bottle costs $7.89. That’s a very reasonable price for a hot sauce. I couldn’t find a guarantee on their website.